I have already put my Winter clothes away & had to reluctantly pull them back out again (thank you late March snow)... but enough is enough. I have decided to wear a new Spring item every day until this silly weather gets its act together. The things I am dying to wear most in my closet - OPEN TOED SHOES - oh the luxury! What warm weather clothes are you wanting to wear most? 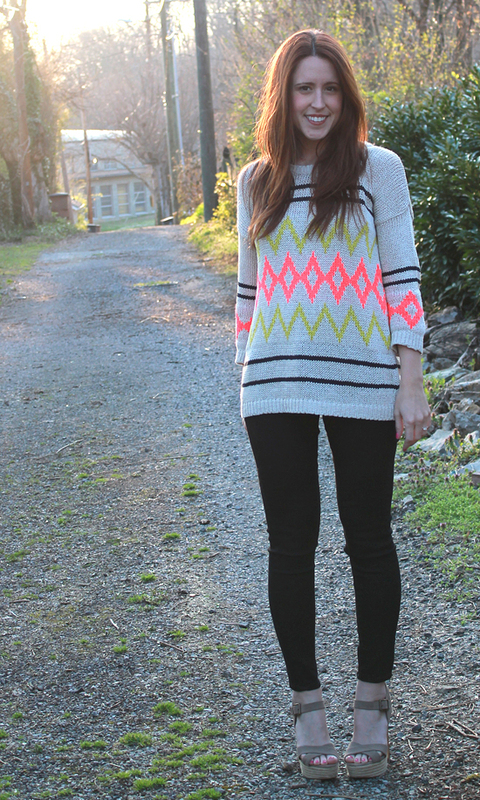 Such a fun sweater, love the colors and print! I gotta be honest, if I had just seen that sweater out and about, I wouldn't have gone for it, but it looks great on! Love how you styled it! I wore open-toed shoes for the sirst time last weekend, and it felt like such a treat! We need some more warm weather days! That sweater is so fun! 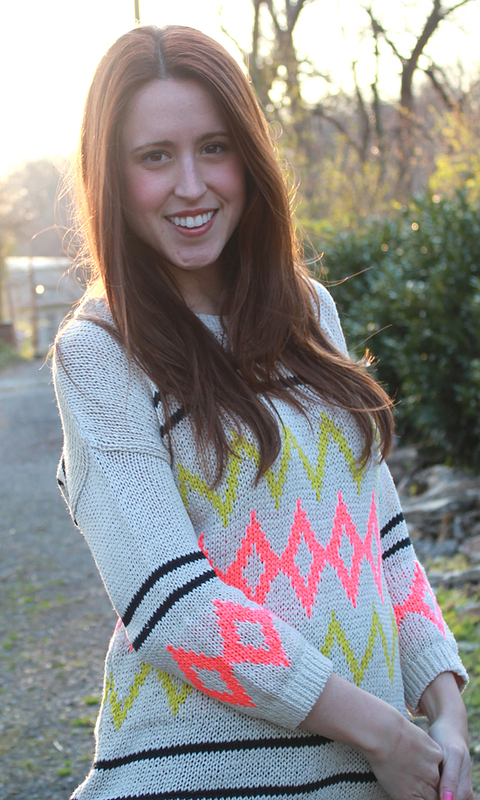 This sweater is so fun! The neon colors make it seem less wintery! I really love this sweater on you, it's so fantastic! And those shoes... LOVE. I totally want a pair! That sweater is absolutely adorable, I'm obsessed! Thank you for sharing! What warm weather clothes do I want to wear most? ALL OF THEM!!!! But open toed shoes is a good pick. Although it means you have to keep your toenails looking nice. So much work. You're too cute! Love this entire look! Personally, I'm also dying to wear my open toed shoes, but also skirts! Lots & lots of skirts - oh and dresses, of course! Ugh, I'm so done with winter clothes! I just moved and got to unpack all of my spring/summer dresses, I can't wait to wear them. It's so much easier to throw on a dress with some flats and a cardigan than to deal with winter accessories. Agreed! I am dying to wear all my warm weather shoes! Gorgeous sweater!! Love the print! That is such a perfect sweater! Love this look! Open toed shoe weather would be a dream! Especially in a pair like that--I don't wear heels....but I should start to. That look F-A-B! This sweater looks super cute on you!! those shoes are so cute!!! your hair looks exceptionally great in this shoot and i really like your sweater! I loveee the neon and neutral on you! That sweater is so cool and those heels - so cute! THOSE SHOES! Dang girl! I have to get my toes summer ready with a pedicure...but I love it with the rest of your look! Who says you can't do winter on top and summer on bottom?! You rocked it! Ok, seriously!!! This spring weather really does need to get it's act together. Grr... I'm the same. I packed away all my winter coats. This sweater is SOOO cute! Love the heels! I just recently got my first pair from Sole Society. Great prices! I hear the rockstar jeans are awesome, is that real? Love the the sweater!! It is real! I am scooping them up in all the colors, one by one, when they go on sale for $19.50. I used to not believe in Old Navy jeans, but the Rockstar cut totally changed my mind! Agreed! I got my first black pair a few years ago, and now have them in red, green, and black again! The Rockstars fit well and for an incredible price! Sometimes the sizes are a little varied though, so I would def try them on in store! Thank you for your comments, they make my day! !